If you are someone with an allergy or sensitivity to eggs or a desire to add more vegan foods to your repertoire, you may be on the hunt for a no-egg chocolate ice cream recipe. Vegan ice creams are soaring in popularity, and there are plenty of outstanding recipe options. Traditional ice cream recipes typically include dairy products derived from animals, such as milk, cream, and eggs. These foods are high in saturated fat and cholesterol, and many individuals have allergies or sensitivities to them. In addition, cooking with animal products may pose ethical concerns for some people. Using a no-egg chocolate ice cream recipe is optimal for all of these reasons! Here is a no-egg chocolate ice cream recipe that is simple to prepare. It is so delicious your guests will have no idea it's vegan! Combine all ingredients in a bowl, and whisk until completely combined. Alternatively, you can put the ingredients in a blender and blend until smooth. Place the bowl or blender container in the refrigerator, and chill it for at least two hours. You may choose to skip this step, but your ice cream will not freeze as solidly if you do. After chilling the ingredients, place the mixture into your ice cream maker, and process according to the manufacturer's directions. Serve immediately, or store in a freezer-safe container until ready to eat. Vegweb.com offers a wide variety of vegan ice cream recipe options. 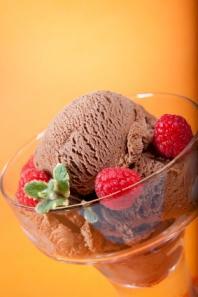 The VegFamily online magazine offers a delicious vegan ice cream recipe. The Vegan Chef offers plenty of delicious vegan dessert recipes, including an outstanding dairy-free and egg-free chocolate ice cream recipe. There are now many commercially made dairy-free and egg-free chocolate ice creams available in grocery stores. Luna & Larry's Coconut Bliss offers many flavors of coconut-based vegan ice cream and is completely free of dairy and eggs. Turtle Mountain offers a wide variety of vegan ice cream flavors as part of its "So Delicious" line of products. Ice creams free of animal products have become so popular there are now several related recipe books on the market. The books offer in-depth instructions for making your own vegan ice creams at home. Lick it! Creamy, Dreamy Vegan Ice Creams Your Mouth Will Love by Cathe Olson: Lick It! offers many great vegan ice cream dessert recipes, including ice cream cakes, pies, and toppings. The Vegan Scoop: 150 Recipes for Dairy-Free Ice Cream That Tastes Better Than the "Real" Thing by Wheeler del Torro: The Vegan Scoop offers plenty of delicious recipes for vegan ice creams with a soy milk base. The book includes traditional flavors such as vanilla, strawberry, and chocolate, as well as unique flavor options such as wasabi and seaweed. Vice Cream: Gourmet Vegan Desserts by Jeff Rogers: This book offers 70 vegan ice cream recipes in a myriad of flavors. The majority of the recipes call for cashew nuts in the base. Until recently, ice creams created from milk, cream, and eggs were the norm for creamy, frozen desserts. However, the ingenious and creative talents of many vegan cooks and chefs has led to a new world of delicious and nutritious frozen desserts!